We are so happy it’s the weekend. We love nothing more than long lie-ins and breakfasts-in-bed with our current reads. We have even more to help you celebrate the best days of the week in the form of THIS unboxing blog, an exciting supplier reveal tomorrow and a cheeky discount code for all of the people signed up to our newsletter list. Click here now to join us for our February Troublemakers box before they all sell out! We were so excited to send out our January boxes for many reasons…we absolutely loved the featured book and we literally squealed with delight when they arrived. I think you’ll all agree that the cover is to DIE for! The foil, the illustration the colour! We are thrilled that we can finally start sharing all our backed up instagram photos of it. Get ready for some serious feed spam, guys! It always helps when the author is absolutely lovely too. Shout out to Alice who has been so supportive and excited about Book Box Club. The Clubhouse meeting is going to be a blast, I can tell! I can’t to chat about Ink with all of our January members. Thank you once again to everyone who has kept the box contents a secret until now. Rest assured you can now feel free to share all your photos/blogs as much as you like. Remember to give us a tag because there is nothing we love more than seeing people enjoy our boxes. Thank you to all of the lovely crafters and small businesses who helped us create our Immortal Stories box. 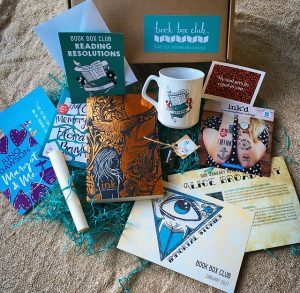 Each Book Box Club parcel is a collaboration with so many people: artists, crafters, printers, box manufacturers, even that turquoise shred comes from another super efficient someone and that’s without mentioning the helpful team down at my local post office who go above and beyond to help us out. Seriously, team Book Box Club grows every month and its so exciting to have so many people along for the ride! UNASHAMEDLY BOOKISH MUG by BOOK BOX CLUB: Brew yourself a cup of Immortalitea, immerse yourself in the world of our stunning featured book and show off your bookishness with our Ink inspired mug, exclusively for our January members. We are so proud of how this mug came out because we illustrated and designed it ourselves. Who knew seeing your design on a mug could be so satisfying?! INK’D CON(TEMPORARY) TATTOOS by U STUDIO: Join the likes of Ink’s heroine Leora by branding yourself with this colourful collection of temporary tattoos, created by one of our favourite Bristol-based creative companies. www.ustudio.design. I don’t know what it is about temporary tattoos but I’ve always loved them. Get ready to see these featured in instagram photos a plenty! 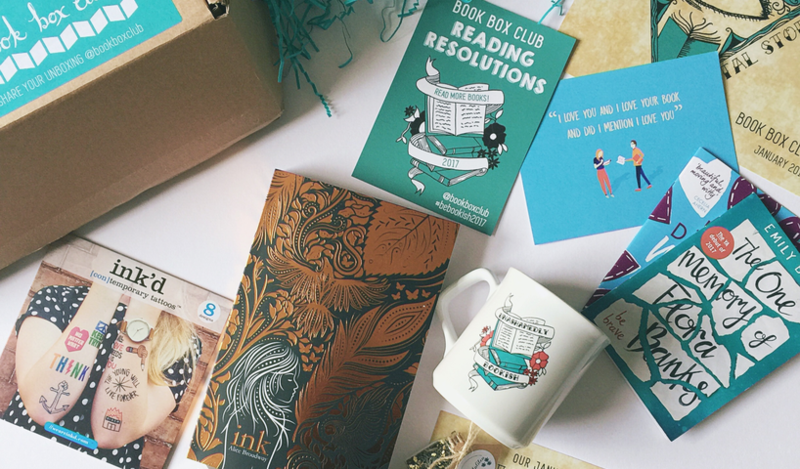 READING RESOLUTIONS CARD by BOOK BOX CLUB: Kick off 2017 with a fresh list of bookish goals. We’ll be sharing our own progress on social media (@bookboxclub), join in the fun by hastagging #bebookish2017. Get tagging people; we’d love to see some of these filled in. Stand by for ours. BOOKISH GOODIES: A selection of extra special previews & a pretty postcard, with thanks to our friends at Penguin Random House, Hot Key Books & Usborne. So there we have it. One jam packed box of fun. We really hope you enjoyed our Immortal Stories box. If you are not signed up for our February Troublemakers box then do head over to our website and bag yourself one before they sell out and standby for a supplier reveal tomorrow in the form of our Crafty Q&A blog post. We can’t wait to let you in on one of the talented people we have had the pleasure of working with this month. Have a look here for more information on what to expect from our Troublemakers box. Trust me, it’s going to be awesome! Have a lovely Saturday, book-lovers.